Books and art publication is a business. Already addressed in the previous post in terms of marketing etc. I am not the poster child for this movement it is not coming out of a vacuum so clearly the publishers and others are talking about it in terms of business decisions. Now whether you agree with or not or what side you are on etc does not mean it isn't being viewed and being discussed and within a business context. Using your logic if a publisher is producing a book aimed at a white audience than the only people involved in it's production should be white. I'm sorry, this whole focus on race, representation and appropriation truly has become bizarre in this country. This is very akin to telling someone they are not allowed to be offended by something just because you aren't. It denies them of their own experiences. @Stephanie-Hider I will check out that article. If this is too personal don't answer (and I apologize): Did you braid her hair the way she wanted? person A is legitimately and deeply offended by X, person B is legitimately and deeply offended by the converse of X. Now what? Really, what do we do now? Do we choose which one has the right to be offended, thereby denying the other? Or do we say: your offenses both have equal weight so...I guess...what now? I guess we are stuck. Unless we can make judgments and set the bounds of rational discourse (e.g., saying it is not rational to claim offense at X as some kind of trump card or reason to change a policy or to make someone behave in a certain way or say certain things) we are going to (continue to?) have big problems in our society. @mattramsey No I didn't mainly because the way her hair was braided which caused the confusion in the conversation requires a different texture of hair than my daughters. 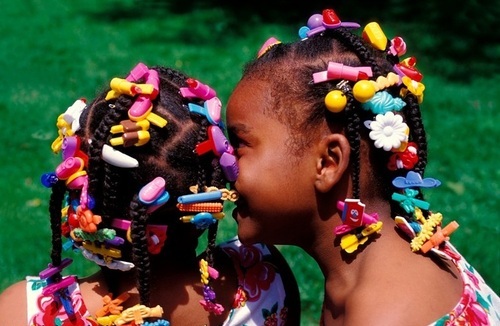 They werent dread locks which is different but more like this I am assuming https://afrocentriqueaz.files.wordpress.com/2015/01/little-black-girl-braids-with-colorful-barettes.jpg Because of the texture of her hair it is braided that way to keep it neat and the barettes of course little girls like. My daughters hair is too fine and would not hold in that style. I understand why you link the article but I think that is quite a bit different and incorrect of them. That is his hair he can wear it anyway he likes, that is just beyond silly and race baiting in my opinion. Had I braided her hair that way and someone had approached her I would be just as put out as the guy in that article and would have defended my daughter. As this translates to the actual conversation however, any publisher can publish any book they like the problem is people are saying hey if you want to SELL me a book about my culture make sure someone from my culture is telling the story which is different in my opinion. Oh and in to answer to the solution. I am not sure there is one. It is not like the racial problem just popped up it has been an ongoing thing on both sides in terms of the white/black thing for quite some time now. Trust me as a biracial kid in the 70s things werent rosy so I know. I think the bigger issue is beyond race though it seems our political system is bent on splitting the country into half. This is a whole other conversation but if historical data is anything to go by we are headed towards a civil war based on policies which generally sets up a worse government in it's place after the turmoil that generally is totalitarian. Not the bright happy picture you wanted to hear but I do believe that is the roadmap we are currently on. There is a difference in selecting an illustrator who happens to be a specific demographic. It's another to choose and illustrator due to them being a specific demographic. One is correct the other is bigotry. Eventually the unicorn of intersectionality will descend from on high and the transgendered, Native American, pansexual, disabled female will have all power conferred to them and will then be able to tell us what to do. I am also from the U.S. and this made me laugh so hard. All hale the Unicorn of Instersectionality! Personally I would never presume to draw or write about something that I don’t have personal experience with, but that doesn’t mean that I can’t draw a child with brown skin if it’s in a context that I have experience with. In the past when I have drawn a mix of children, they have been drawn generically. For example, the little girl with the tight curls could have any color skin and hair color and still be appropriate. Same with the little boy with the heavy eyebrows. As @Jake-Parker said about women in the last podcast, there are a hundred different shapes to a women, the same applies to the human race. All that being said I believe that with proper art direction and understanding a white person could illustrate a book written by a Native American. And visa versa and etc. It is a bummer that you @smceccarelli have been asked to segregate yourself. I would take it with a grain of salt and trust your own judgement. @evilrobot I’m glad you posted this link. I thought to do it but you beat me to it. It is a great conversation.